Officially, we still have a few weeks of summer left, but all of us know that Labor Day is the real end of summer. We’ve enjoyed the last blowout barbecue or beach weekend, put away the tiki torches and sand chairs, and are starting to think about donning heavy sweaters and heading to the pumpkin patch. In July and August, my husband, Kevin, and I pick up local sweet corn, slather on some garlic-parsley-cayenne butter, and place it on the grill for a sweet-spicy-smoky flavor. Now that Labor Day has come and gone, we try to hang on to the last vestiges of the season by bringing these flavors inside. 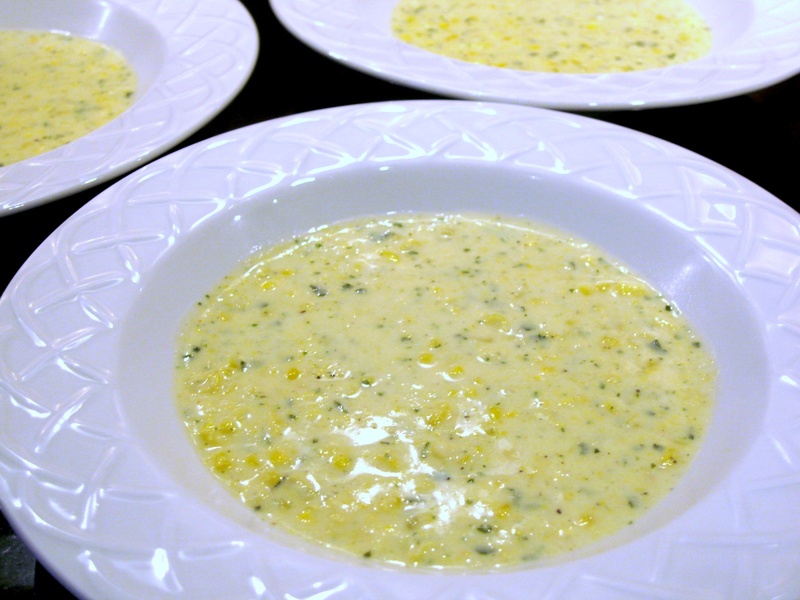 Fresh sweet corn is still readily available in September, so I use it to make a rich, buttery concoction that is part cream soup / part chowder. Removing the kernels from the cob with a paring knife is easier than expected, and even easier with a corn zipper (I picked one up at the discount store for a couple of dollars). Cooking the corn briefly and puréeing only half the soup leaves the crunchy, burst-in-your-mouth flavor of corn on the cob. And the cayenne adds just the right amount of heat – reminiscent of a summer well spent. My Mother-in-law loves my corn zipper! Husk corn, remove silk and wash ears. 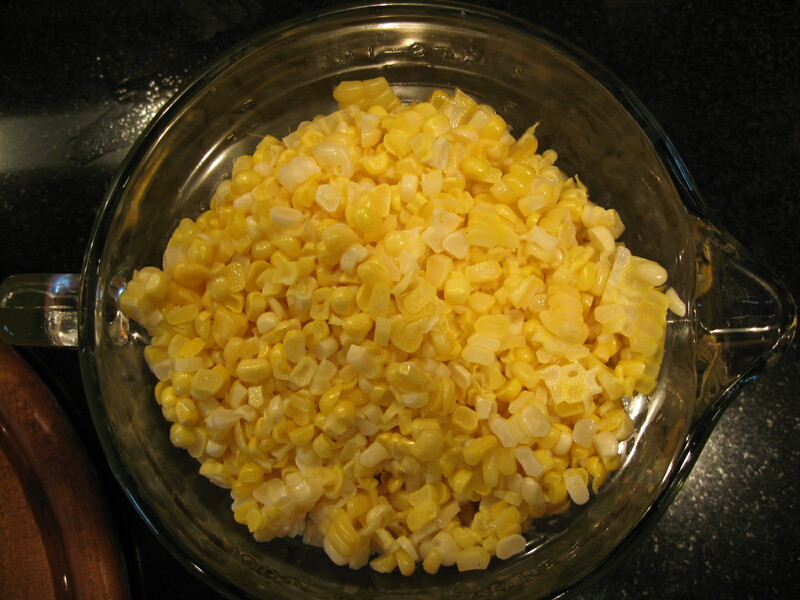 One at a time, remove kernels from each ear of corn with paring knife of corn zipper by placing the tip in a large bowl, and slicing down toward the bowl. Continue in this manner until all kernels are removed, being careful not to cut off any cob. 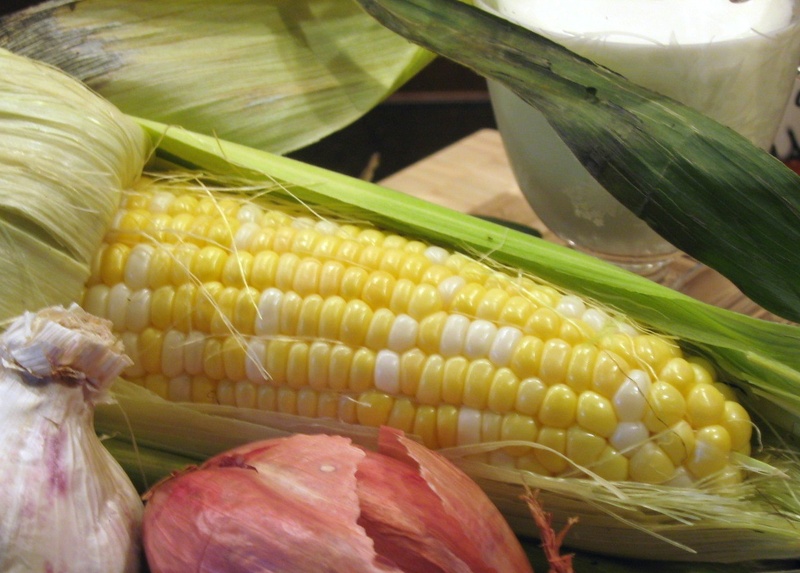 Place corn and any corn milk in heavy saucepot, cover with water, and bring to a boil over high heat. Reduce heat, and simmer for 4 to 5 minutes. Remove from heat and set aside. Melt butter in second heavy saucepan over medium heat. Add garlic and shallot, and sauté for 2 to 3 minutes until tender, but not browned. Add flour, mixing into butter with back of wooden spoon. Gradually add half & half, stirring well after each addition. Add parsley, salt, pepper, and cayenne. When mixture begins to bubble slightly, reduce heat and simmer for about 5 minutes, until thickened. 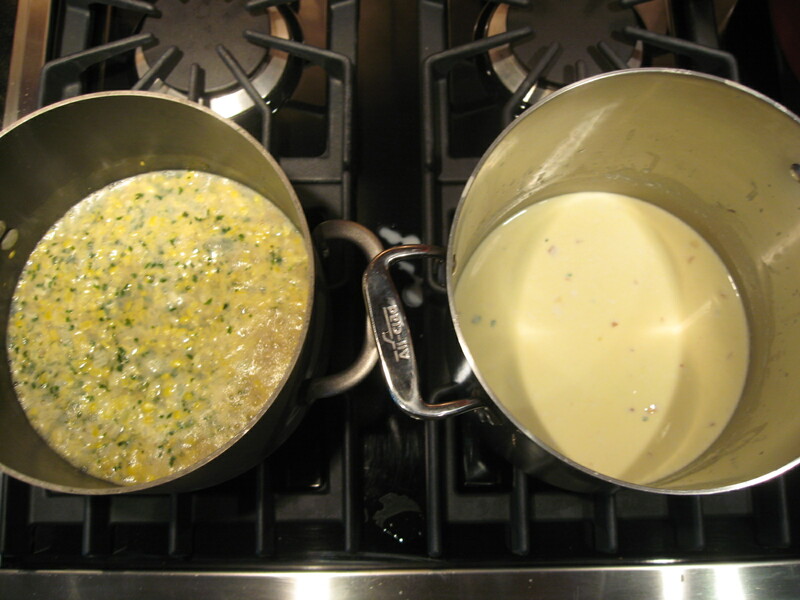 Add about one half of the cooked corn and water to the cream sauce. Place in blender or food processor and purée until smooth. Combine blended mixture and remaining corn / water mixture and reheat to serving temperature. Makes 5 – 6 cups. This looks fantastic! And I am very excited to see a corn zipper in action. I have always seen them in store and wondered if they worked better than just using a knife. Corn and bacon is a great combo! Love it! looks and sounds fantastic. Love the corn zipper. Ooh I love this! 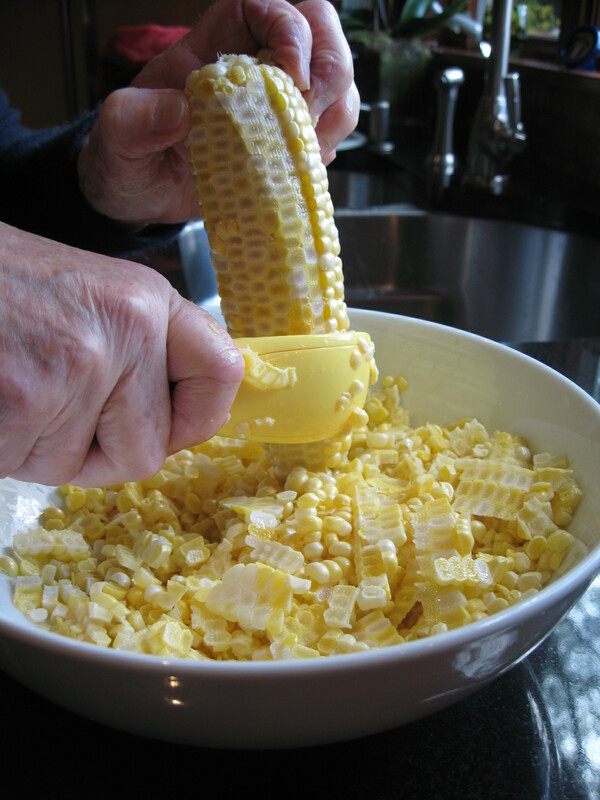 I’m searching for some good corn recipes to use up the corn I bought and somehow haven’t found a use for yet–this looks delicious. And I also love the corn zipper! Thanks! I know what you mean. Frozen sweet corn works in a pinch, but it’s just not the same. Sounds wonderful, I’ll give it a try. Thank you! I hope you do try it. Let me know what you think!